With fall weather hopefully on our heels, it’s time to stock up on light jackets and coats – we all know that it really doesn’t get chilly in Texas until November (and by chilly, I mean 50’s-60’s), so as we transition into these cooler months, we really only need light layers to keep us comfortable. A few styles I look for this time of year include a featherweight trench, a sweater coat (this one is also pretty great), and a cape style coat (love this printed one too!). It also doesn’t hurt if a jacket or coat is reversible – so many styling options! Love this belted camel one and this leather-trim reversible coat. The open style of all these options (shorter sleeves, belted vs buttoned) make them perfect for transitional wear. Neoprene is also a wonderful, light fabric that’s ideal for these next few months! From December-February, it really starts to cool down here in Dallas – a heavier coat is then needed, and I have plenty of those on my list as well. I’m obsessed with this twill cargo coat by Alexander Wang – utilitarian chic at its best, don’t you think? Shearling is a big trend this season (this Tory Burch tote is at the top of my “Most Wanted” list! ), and this Akris parka is hitting all the high notes. Leather cuffs makes this other Akris coat another winning choice – classic and cool. Stock up on these fabulous pieces and more designer duds at Nordstrom! I love your sunnies, they are so cute. We only get a couple weeks of temperatures suitable for such light layers before we need to reach for the heavy coats! It’s too bad because your coat is lovely! 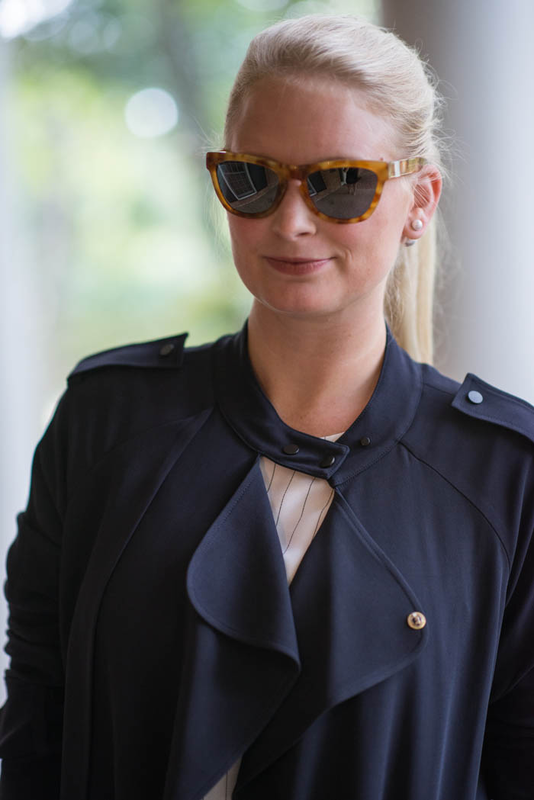 LOVE those sunglasses & the draping on this trench is beautiful! I love this light trench! You always find the most beautiful outwear in the most flattering shapes! and that bag…LOVE! so classy as always! Love your sunnies. so gorgeous! light outwear is my absolute favorite but for some reason nearly all of my jackets are more winter than fall appropriate. i think i need to change that this year! Ooh, I love this layered look! And I especially love your shoes! Love the long trench and the shade is perfection! Gorgeous coat! I love those heels too. You look stunning, what a perfect look! Finding the right lightweight jacket is a huge success!!! You’ve nailed it with this one!! I’m in love!! And PS: those sunnies are amazingggg!! 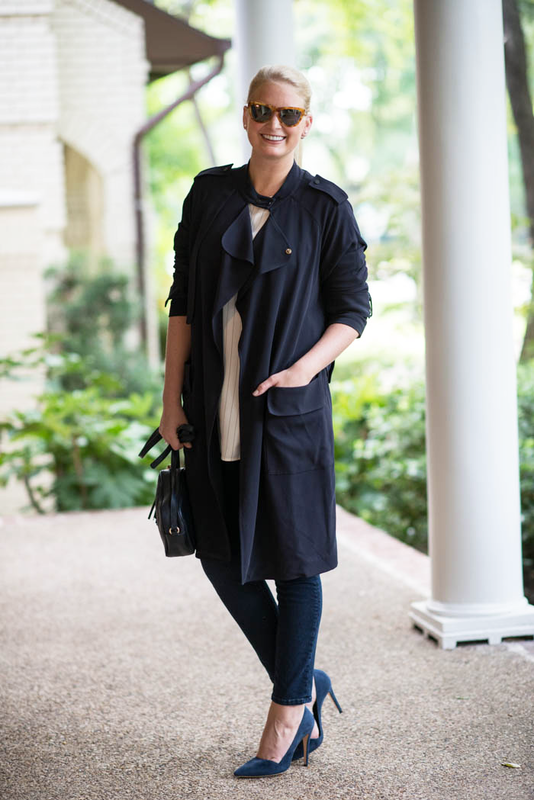 I just love a classic trench. It’s so sophisticated and elegant! This navy one paired with those chic sunglasses and your gorgeous blue heels is perfection! 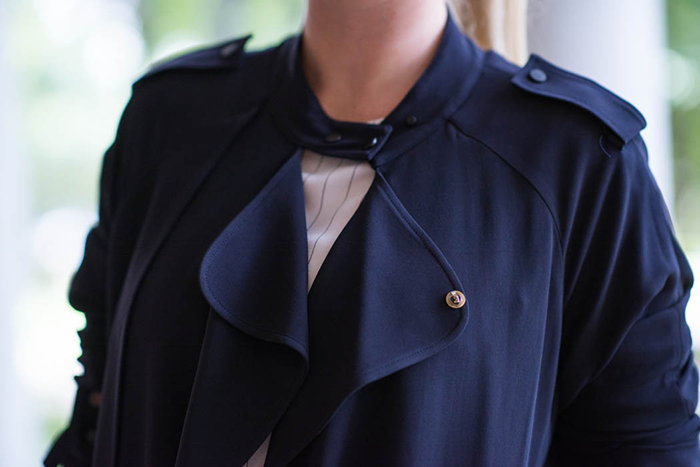 Love this jacket – its so flattering! Nice jacket. And I like you’re hair in a pony. PS, speaking of coats…be sure to check out my post this upcoming Monday. Beautiful and very elegant outfit! Love the navy overcoat! It’s great to wear a light jacket. Love the one your wearing!